Step out of the city life by going to Lincoln Park Zoo and Grand Mere State Park. Satisfy your inner culture vulture at The Art Institute of Chicago and Marquette Building. When in Chicago, make a side trip to see Silver Beach County Park in Saint Joseph, approximately 1h 40 min away. There's still lots to do: wander the streets of The Magnificent Mile, stroll through Ohio Street Beach, enjoy breathtaking views from Skydeck Chicago - Willis Tower, and make a trip to Millennium Park. To see more things to do, traveler tips, photos, and more tourist information, read Chicago trip itinerary maker site . Madison to Chicago is an approximately 3-hour car ride. You can also take a bus; or fly. Traveling from Madison in August, you can expect nighttime temperatures to be a bit warmer in Chicago, with lows of 67°F. 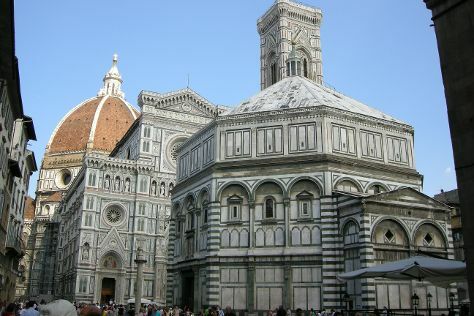 Finish your sightseeing early on the 5th (Sun) to allow enough time to travel to Florence. Your cultural itinerary includes sights like Galleria dell'Accademia and Piazzale Michelangelo. Visiting Easy Living - Spiaggia sull'Arno and River Rafting & Tubing will get you outdoors. Next up on the itinerary: admire the masterpieces at Uffizi Galleries, snap pictures at Ponte Vecchio, make a trip to Piazza della Signoria, and get engrossed in the history at Basilica di Santa Croce. To find where to stay, traveler tips, maps, and more tourist information, you can read our Florence trip itinerary planning app . You can do a combination of flight and train from Chicago to Florence in 14.5 hours. Alternatively, you can fly. Due to the time zone difference, you'll lose 7 hours traveling from Chicago to Florence. In August in Florence, expect temperatures between 86°F during the day and 64°F at night. On the 10th (Fri), wrap the sightseeing up by early afternoon so you can travel to Stuttgart. On the 11th (Sat), admire nature's wide array of creatures at Wilhelma Zoo and Botanical Garden and then examine the collection at Mercedes-Benz Museum. For photos, where to stay, traveler tips, and other tourist information, refer to the Stuttgart tour itinerary builder . Traveling by flight from Florence to Stuttgart takes 6 hours. Alternatively, you can do a combination of flight and train; or drive. Expect a bit cooler temperatures when traveling from Florence in August; daily highs in Stuttgart reach 76°F and lows reach 56°F. Wrap up your sightseeing by early afternoon on the 11th (Sat) to allow time for travel to Dublin. Get a sense of the local culture at Kilmainham Gaol and St. Michan's Church. Escape the urban bustle at Castlecomer Discovery Park and Seapoint Beach. Go for a jaunt from Dublin to Kill to see Celtic Rider about 42 minutes away. Next up on the itinerary: sample the tasty concoctions at Guinness Storehouse, stroll through Racing Tours Ireland, wander the streets of Temple Bar, and pause for some photo ops at James Joyce Statue. To see more things to do, maps, where to stay, and tourist information, go to the Dublin trip itinerary planning tool . Getting from Stuttgart to Dublin by flight takes about 5.5 hours. Other options: do a combination of train and flight; or do a combination of car and ferry. The time zone difference when traveling from Stuttgart to Dublin is minus 1 hour. Expect a bit cooler temperatures when traveling from Stuttgart in August; daily highs in Dublin reach 66°F and lows reach 51°F. Finish your sightseeing early on the 15th (Wed) to allow enough time to travel back home.